Confronting Antimicrobial Resistance: Can We Get to Collective Action? Imagine if a small cut could evolve into a lengthy hospital stay, or worse; if doctors refused to perform surgery or transplants due to prohibitive risk during recovery; and if our collective gains against the world’s biggest infectious killers—HIV, malaria, tuberculosis, sexually transmitted infections, pneumonia, and more—slowed, stalled, and reversed. These nightmare scenarios could become the new global reality if common pathogens evolve to withstand and survive treatment with antimicrobial drugs, a phenomenon known as antimicrobial resistance (AMR). 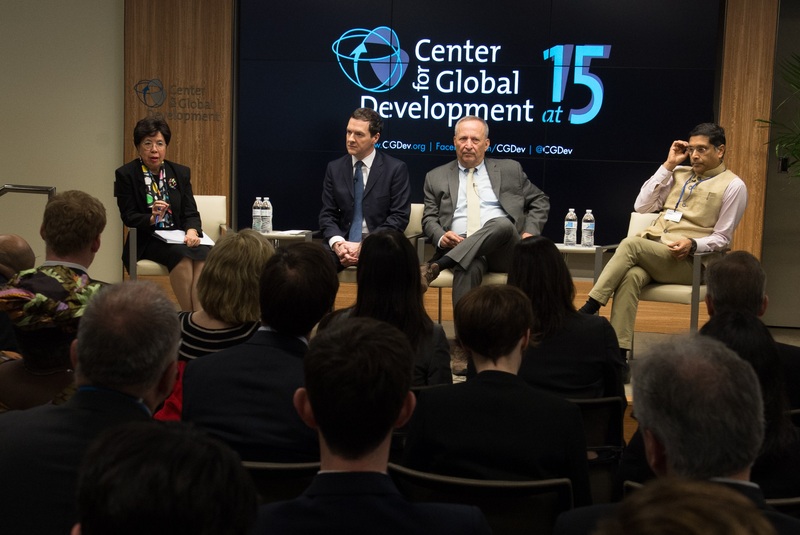 Last week, CGD hosted an exceptionally distinguished panel to discuss the challenges and opportunities in mounting a global response to this serious threat, comprised of Rt Hon. George Osborne MP, chancellor of the exchequer of the United Kingdom; Dr. Margaret Chan, director-general of the World Health Organization; Lawrence Summers, Charles W. Eliot University Professor and president emeritus at Harvard University, and CGD board chair; and Arvind Subramanian, chief economic advisor to the government of India and on-leave CGD senior fellow. We also heard a technical discussion from Amanda Glassman, vice president for programs and director of global health policy at CGD, and Hala Audi, head of the secretariat for the UK’s Review on Antimicrobial Resistance. Together, the panelists’ remarks underlined the gravity of this global threat; described the considerable barriers to an effective response; and called on the international community to take appropriate global action. Antimicrobial resistance is already causing huge harm – and the worst is yet to come. To open the panel, Dr. Chan issued a serious warning about the size and scope of the AMR threat: “everyone will be affected if we do not address this problem.” AMR is already responsible for an estimated 700,000 global deaths each year, 50,000 of which take place in the US and Europe. Extensively drug-resistant (XDR) tuberculosis—cases where the most effective first- and second-line drugs are rendered useless—infected an estimated 47,000 people worldwide in 2014, only one ‘last-line’ antimicrobial is available to reliably treat gonorrhea, and few new antimicrobial drugs are in the development pipeline. According to the latest review, AMR could cause 10 million deaths each year by 2050, with knock-on effects draining many trillions from the global economy. Summers suggested that AMR and potential pandemics, alongside climate change and nuclear proliferation, represent the top three existential threats to life on earth as we know it. And as Dr. Chan explained, the worst-case scenario implies the end of modern medicine as we know it. Even worse, Summers suggested that AMR seems like a “quintessential non-linear phenomenon, and therefore more dangerous.” Year by year the effects are small and mostly invisible. But at some point in the future they could suddenly become catastrophic, like a “levee that doesn’t hold and unleashes a flood.” Dr. Chan concurred that “the tipping point is not predictable because…microbes are invisible. We don’t even know when they’re going to make the switch” to become resistant to existing drugs. Antimicrobial efficacy is a global public good threatened by serious market failures. In response to this huge threat, why don’t pharmaceutical companies invest in new antibiotics? “It does not pay” for them to do so, explained Osborne. Pharmaceutical companies want to invest in technologies that will make a lot of money, and soon; so long as other antibiotics remain effective, the market for new options will be tiny and unprofitable. Even worse, as Summers pointed out, “markets don’t reward preparations for disaster.” Even if a company successfully developed a new option, public pressure would likely force the company to price the drug below market value at the time the drug is needed most. On the other side, individual doctors, patients, and even countries have exceedingly weak incentives to conserve the existing stock of antimicrobial effectiveness. Patients want immediate relief from their symptoms, without waiting for test results; doctors want to serve their patients’ needs and meet their demands; and country governments are hesitant to devote political capital to propose and enforce unpopular policies to cut antibiotic use in medicine and agriculture—especially if other countries are refusing to follow suit. And unlike littering, Summers noted that few people feel any moral responsibility related to their use of antibiotics. Collective action is needed to confront this global threat. Related: What About a Global Treaty to Feed Pigs Yogurt Rather Than Drugs? AMR is a global challenge, and collective action from global leaders is needed for an effective response. The AMR review estimates that $16 to $37 billion is needed over the next 10 years to stimulate new antibiotic development through incentive mechanisms, such as market entry rewards or the Advance Market Commitment approach pioneered by CGD. But countries also need to rationalize and regulate the use of existing antimicrobial resources, which can prove challenging for domestic policymakers. Is there political will to tackle AMR? Panelists varied in their degrees of optimism. Subramanian noted that AMR must compete with other priorities for a slice of the “international good will” pie; to get sufficient attention, such global public goods will need to attract attention away from traditional aid and lending, for example. Summers disagreed, suggesting that we can expand the capacity for global cooperation over time through successful, cumulative efforts. Raising new money appears to be a particularly difficult task. Osborne noted that the overall amount needed is quite small when compared to the economic costs of AMR; however, he offered few specifics about where those funds might come from. Political momentum to address the challenge is building. In 2015 the G20 affirmed the necessity of a coordinated international response to confront AMR. This past January, 98 companies and 11 industry associations from the pharmaceutical, biotechnology and diagnostics industries issued a joint declaration in support of efforts to conserve efficacy, accelerate drug development, and improve global coordination—including their own commitments to help that process along where possible. Global leaders and institutions must now expand these nascent efforts to effectively and collectively confront the worldwide AMR threat. You can watch the event in full here.